Break the cauliflower into florets. Steam it for 15 minutes until tender, and set aside and keep warm. Sauté the diced bacon in a wok on high heat until crispy – then remove from wok with slotted spoon (so fat is drained) and set aside. Reserve bacon grease for other uses. Make a béchamel sauce: melt a stick of butter in a pan over a moderate heat and then stir in flour a spoonful at a time until you have a thick paste (a roux). Cook the roux for a couple of minutes, stirring, stirring all the time and watch it expand. Slowly add milk and keep stirring until you have a smooth, thick sauce. You may want to switch to using a whisk. Season to taste with salt, pepper, and nutmeg. Gradually stir in two-thirds of the grated cheese. Save the rest to sprinkle on top. Put the cauliflower into a baking dish and then pour the sauce over it. Then, sprinkle the remaining cheese on top. In a small saucepan, melt 3-4 tbsp butter and then mix it through the breadcrumbs to moisten them. Sprinkle the buttered breadcrumbs on top. Bake at 200°C for 30 minutes or until breadcrumbs are browned and casserole is bubbling. Sprinkle the reserved bacon on top when it comes out of the oven, and serve. 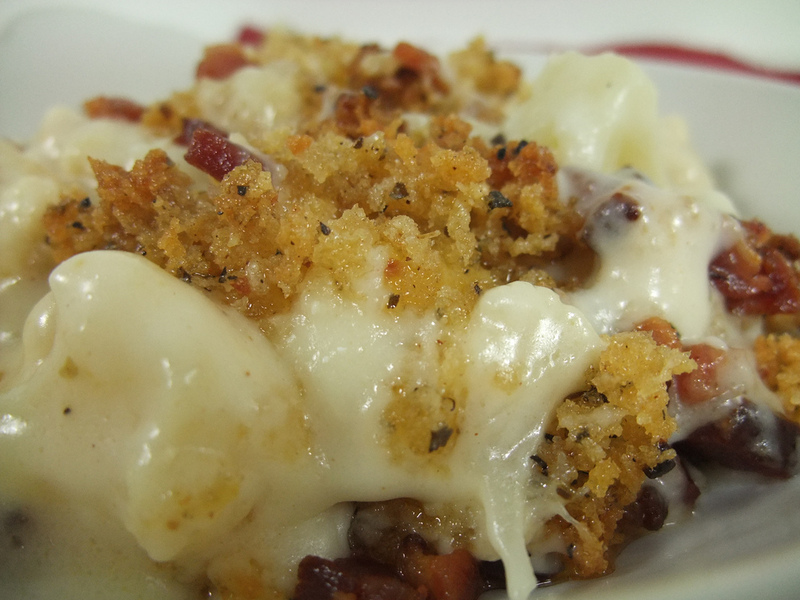 This entry was posted on April 20, 2011 at 7:23 pm and is filed under Food with tags bacon, bake, béchamel sauce, breadcrumbs, butter, cauliflower, cheddar, cheese, milk, nutmeg, oven, pepper, plain flour, recipe, roux, salt, sauté, wok. You can follow any responses to this entry through the RSS 2.0 feed. You can leave a response, or trackback from your own site. Oh Mercy, that sounds good. I never met a cheese I didn’t like, and added to butter and bacon? Nutmeg and bread crumbs? I’m SO there. I usuall don’t leave more than one comment on a post, but in this case, I will make an exception. I, too, would die without cheese. Or want to, anyway. *usually*…now I’ve left three. tsk.